Attacked and beaten. Car blown up. Professional reputation and career ruined. Background and contribution: Long-time Zundel attorney in Germany, Rieger has been a defender of German patriots since his law school days. 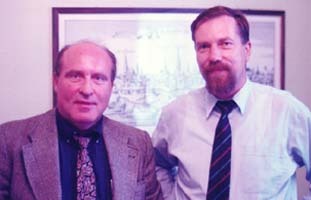 He has drawn the ire of the Holocaust Enforcers by winning the 1981 Zundel case in Stuttgart against the false claim that Z¸ndel had published "hate literature", and winning several cases against the German vassal regime who had confiscated Z¸ndel's postal bank account, unfreezing DM 30,000 in the process. He also managed to regain for Z¸ndel his confiscated German passport - after a six-year legal battle. Rieger was attacked and beaten unconscious in broad daylight after leaving a Hamburg courthouse and had to be airlifted, near death, by helicopter to the trauma unit of the hospital of Hamburg University, where he lay unconscious for days. The assailants escaped after their assassination attempt. German police later caught one Turkish "guest worker" who was tried - and let go! The other culprits were never found.